However it also has a stand-alone controller which is highly recommended for flying, as the app controls are not that good. Camera quality is quite decent, it could use a stabilizer tho. Flight time is about 6-9 minutes. 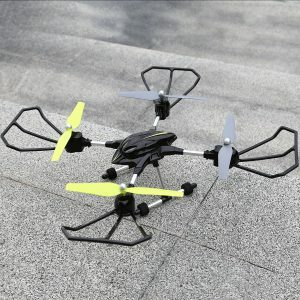 This drone is quite good for beginners and camera is surely a good addition, but is there really any point in the live feed? I mean sure it’s good to know what drone sees to get better footage, but after 5 meters it starts to lag real bad and worst thing is that you can’t even start video recording via controller, you must use app and using wireless drains the battery and reduces flight time. However drone itself is quite solid and propeller guards are really useful for beginners and when using controller, it’s very easy to fly (if you have common sense). Maybe bit pricey, but it’s a decent drone. Let’s take a look a this new RC Quadcopter. I highly recommend you to watch the Video Review, but if you don’t have time to watch the video, then we sum it up as quickly as possible. Nearly impossible to control via app (I’ve flown lot of drones, including the almost identical parrot drone, but this drone is horrible, the app is very un-responsive) So I highly recommend using controller as app controls are useless. So to sum it up, I think this drone is not as great as many others. Price is quite high, yet it has quite few serious faults that ruin the experience. I mean drone is good, but is it worth the money? I mean you can’t even record a video when using controller, so you MUST have a smart phone / tablet with the app installed and connected to drone, but during that … it also transmits live feed, draining the battery very fast. Also the app controls are useless, drone is nearly impossible to control via app (as seen on video). Propeller guards are horrible too, they just rub against propellers as soon as you touch anything with them. Drone would be fine when you plan on flying it by using controller only, but you’d be paying for the camera and other features too, which are nearly useless. Hope you get the point. If they’d lower the price by a good 50%, then it would be totally worth it, but for this price? no … i can’t recommend it. There are lot of other drones that are cheaper and better. However I do admit that I love the near real-time camera feed, other drones have a good 1-2 second delay, while this has 200-300ms only, which makes it possible to fly it by only looking on the app screen. However they need to get these Cons right, then it would be worth it. Here we review 4 drones in 1, they’re all small to mid-size drones. Those are the drones which can be flown inside and outdoors. First I’m going to list the drones and complete review videos (if you want more details about them) and I will list pros and cons and then make a final verdict on those drones, let’s get started! 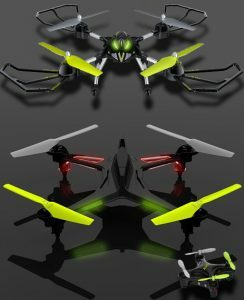 This is the cheapest drone out of all 4 listed here. Mohawk is a scary name, no surprise there that it can lift the most weight. It comes with a 780mAh battery, giving you around 7-8 minutes flight time. However this drone is only one that does not hold altitude on it’s own, you must adjust the thrust yourself with left analog. Left analog doesn’t “spring back” to neutral position, it keeps it where you put it, so you could set it to hold thrust, but thrust doesn’t mean it holds altitude. So you need moderate skills to be able to fly this without accidents. Does not include a camera, however it does have different sockets for a drone camera. I think it’s best looking drone out of these 4, I can’t decide, the HS200 looks cool too. This drone doesn’t have propeller guards either, which is a step down for sure, however propellers are quite sturdy and can take a punch, so don’t fly it in your face, it can really hurt! Comes with usual stuff, such as 360 flip ability, 1 push return (which is useless) and headless mode (which is useless too). It’s also very sensitive, if you have the skill, this drone is best for agile flying. This is the smallest and lightest drone of them all, also most durable if you ask me. This drone does not have a stand alone controller, it can only be controlled via smart phone or tablet by using their Parrot app. Drone has very sturdy and good design, propellers are just pushed on, no screws. This also means something they fly off if you crash, but i think it’s better, because if they are too sturdy, they’d just break off, which would be bad. This drone can take a beating for sure. Also this drone has headlights (bright LEDs). It’s very stable, however I find app controls worse than controller, because you have no physical feedback if you are pushing any buttons or not. This drone is lot of fun and I recommend this for the ultimate beginners, as it can take a beating and is very easy to control. This drone’s special feature, is that you can use a special take-off mode, where you can throw the drone out of your hand and it automatically corrects itself and starts hovering, you can literally throw it (first you must activate the function tho). You can see it on the review video! So that said, i think this is best for first time fliers. This is a semi-pro drone with loads of features and stand alone controller that has a LCD display on it. Drone comes with propeller guards and landing gear, which need to be screwed on, making the initial setup bit time taking. Drone has awesome LED lights, under and in front (in windshield). It has the usual 360 flip, 1 push return, headless mode ..etc features. This drone doesn’t look much, but it handles like a dream, very easy to fly. Also this drone comes with a 720p camera (records audio too), however it’s not a good quality camera (seen on video). It also includes a 4gb micro SD card, you can take photos or record a video (via controller). This drone also comes with 2x 750mAh batteries and 2x USB chargers, so you can have 1 battery charging while flying or you can charge drone + extra battery at same time. On top of that, it includes a micro SD to USB adapter, so you can transfer your videos / photos to your PC with ease. I think this drone has the coolest controller, but drone itself doesn’t look that good. Camera is lightweight and detachable and can be used on many other drones (semi-universal). This drone is suitable for beginners. This drone has really awesome looks, it’s very similar to F181 Chaser, but has more features and is slightly harder to control (bit more unstable). Let’s start by saying that this drone has a 720p WiFi camera, meaning you can connect to it via smart phone or tablet and see the live feed, however don’t get too excited, it has a good 2-3 second lag, so it’s not suitable for flying via the live feed camera. It’s only good for taking good shots and videos when flying, so you can see what drone sees. Unlike the Chaser’s camera, this one does not record audio. Assembly of drone is very easy compared to Chaser, as landing gear and propeller guards does not require any screws to be used, you just push them in and make sure they’re tightly in place, but be careful that you don’t break any of the cog gears or blades in process! This drone also comes with the highest price tag, yet with smallest battery, only a 650mAh battery. I think Parrot has 550 or 600mAh actually, but well Parrot is a lot smaller, so 550mAh is a lot more for Parrot than 650mAh to this. HS200 and Chaser are about same size and weight. You can also control this drone via smart phone app called “Deerc FPV” or you can use included controller. Camera’s feed can be broadcasted via WiFi to your phone / tablet and then you can use the included mount to mount your phone onto the controller, quite neat! Also this drone doesn’t have the lights off function like the Chaser, small battery, lights always on + wifi on = 5 minutes flight time or even less, which is BAD. I think it should have at least 750mAh battery, it can easily carry 1500mAh battery, so no idea why they put so small battery. Drone is easy to fly, not as easy as Parrot or Chaser, but close to it. So it’s suitable for beginners. 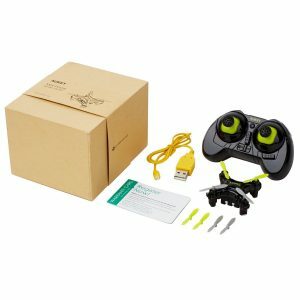 If you are looking for a cheap drone, then Aukey MoHawk is for you, but if you’re looking for easy to fly drone, then Parrot Blaze will do the job (requires smart phone / tablet). Chaser and HS200 are in between, however Chaser and HS200 have the most features and they both have included 720p Camera. Good thing about Chaser, HS200 and MoHawk, is that they all use same battery type, which is 3.7v LIPO battery. So if you own more than 1 drone, you can swap batteries according to needs. You can also use Chaser and HS200 camera on MoHawk. In fact MoHawk drone has 4 different camera connectors, while others have only 1 and Parrot doesn’t support camera at all. So which is BEST drone? Well there’s no such thing as best drone. They’re all good in their own way. I think Chaser is weakest of them all, blade design is very flimsy and it feels like they might break any second. Parrot has flexible blades, which can take a beating, while MoHawk has very sturdy blades, which can do some damage to surroundings and HS200 is in between of Chaser and Mohawk. They’re all suitable for indoor and outdoor use, they can all do a 360 flip with push of a button. So you have to decide which drone to go with, depending on what you are looking for to do with the drone. This is one of the smallest Quadcopters ever! As you can see on the picture, it’s really, really tiny. Compare it to the USB cable next to it. It’s not just small, it’s very easy to fly this drone. G-Sensor: It can sense the crash and cuts the power if you do crash it, even the slightest tap can make it cut the power. useful so that you don’t damage propellers. This drone is lot of fun and easy to control, it’s designed to be flown inside rather than outside, as obviously it is very sensitive to even smaller winds. Other buttons are for trimming the movement. If drone keeps drifting to certain direction, you can counter it using the trim buttons. Start by placing the drone in front of you on table or ground, flip the on/off switch to ON position and make sure drone is facing the same as you (blue lights front / red lights back). Now on controller push left analog all the way up and let it go instantly, controller will beep and drone lights will stay on (instead of blinking), now drone is ready to fly. Push the take off button and be read with your right thumb to control the drone movement to keep it away from objects (or yourself). It’s important to place drone so that it’s facing you, so when you push the analog LEFT, then drone goes left, it’s very easy to learn it. Takes no more than 5 seconds, it’s common sense really. Left analog can be used to go higher or lower and drone will then remain on that altitude by itself. Left analog left/right is used to rotate the drone, that’s in case you want to change your own position and want the drone to face right way again. To land, press the land button or just use left analog and push it all the way down and “slam” it onto ground, any small bump will automatically cut the power to drone, so crashing it gently will make it turn off too. Let’s take a look at Aukey’s BLACK SPARROW Quadcopter drone. It’s in the big drone category with it’s 54cm x 54cm “wing” span. that is if you’re using the blade guards. Let’s keep it short, but detailed. Battery is replaceable / removeable, so you can buy more than 1 battery and keep going. You can also replace the battery with a higher capacity battery, they’re heavier, but it carry quite the bit of weight. Supports special drone camera, it has connector on drone and button on controller, but camera is not included. It’s suppose to have intelligent altitude hold, but it wasn’t working so well for me, same with headless mode, it’s suppose to have headless mode, so that drone’s forward is always in same direction as controller points, but I couldn’t get it working. – Trim buttons / switches = those can be used if your drone constantly drifts, then you can counter that to make it more stable. 2. Start by going into open area, with no trees, water or tarmac nearby, grass is best to start on. 5. Now learn the throttle response, apply throttle very gently, there’s no need to even take off with the drone, just apply it gently to learn the response, then slowly apply more until drone starts to hover, try keeping it no higher than 10cm from the ground, keep doing that until you’re comfortable with throttle response and you are able to hover the drone stable at around 20cm from ground. If at any point you get scared or are uncomfortable with controls, just slide the analog all the way down and drone will instantly land, this is why you should not go higher at start, you may break it. 6. Now that you’re comfortable with throttle, take off and keep the drone at about 30-50cm from ground and start learning the movement, which is the right analog. Now it is very important that you and drone are facing same direction. So that when you push the analog forward, then drone goes forward, if drone is not facing same way, then drone’s forward is where drone is facing, meaning that it’s extremely difficult to control it. So start by moving the drone left / right / forward / backward by not going too far from the starting area, idea is to learn the controls first. So try flying 1-2 meters forward and then come back, if at any point you feel like losing control, use the throttle to bring the drone back to ground. Under 50cm from ground, it is quite safe to “slam” the drone on the ground without breaking it, this is why you should not go any higher when learning the controls. 7. Finally when you’re comfortable with throttle and movement, it is time to learn the hardest part, which is rotating the drone. This can be done by moving left analog left / right to rotate, however it’s hard moving the analog only left or right without going up / down at same time, this means drone will get more or less throttle and it’s easy to lose control, this is why it’s important to learn the throttle first, so you’re comfortable with throttle and know how to counter too much or not enough throttle. Hope this makes sense. 8. Now that you’ve learned how to control throttle, movement and rotation, try taking it for a spin. Remember, go slow and don’t panic. If at any point you feel like losing control, slowly decrease throttle to land the drone. It’s very easy to control the drone if you follow these easy steps and learn it step by step. Hope this helps you learn how to control this (and any other) drone. Take it easy and fly safe!